I have previously written about Just Mayo, a vegan mayonnaise that contains “pea proteins” instead of egg yolk. Another start-up company founded by Patrick Brown, Professor of Biochemistry at Stanford University, makes not only the condiment but the entire burger vegan. Their Impossible Cheeseburger is made entirely from plants and imitates beef in taste, texture and appearance almost perfectly (according to tasters). Just imagine a perfectly grilled burger: Juicy and just a tiny bit bloody in the middle. The molecule responsible for the characteristic red colour and distinct, slightly metallic taste is a complex molecule called haem. Haem contains a co-ordinated iron ion and is part of haemoglobin, the protein that transports oxygen in our red blood cells. The Impossible Cheeseburger gets its haem not from the blood of kettle but from a plant of the legume family (which includes beans, peas and peanuts). These naturally produce leghaemoglobin which is functionally and structurally akin to mammalian haemoglobin. It is red in colour, also contains the haem co-factor and apparently makes a fake burger just as bloody as real beef. 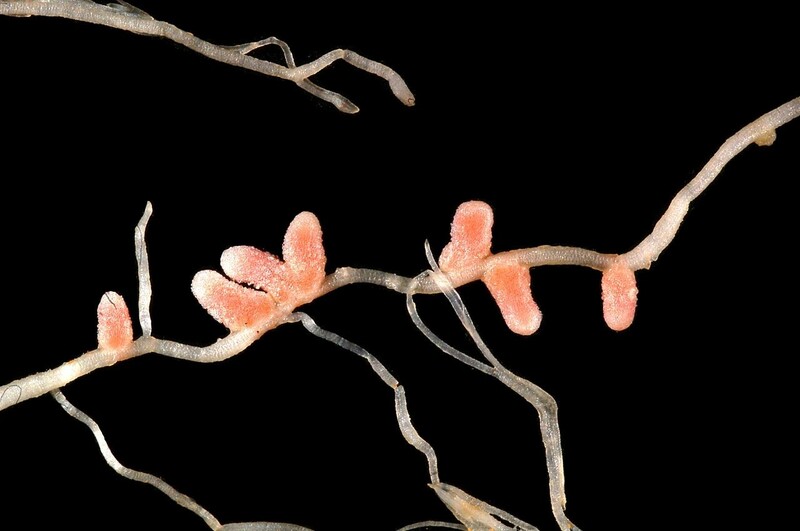 Legumes live in symbiosis with Rhizobia bacteria that populate specially formed nodules in the roots. Those bacteria convert atmospheric nitrogen (N2) to ammonium (NH4+) which the plant is then able to use for growth and development. In exchange, the bacteria are supplied with sugars. Nitrogenase, the bacterial enzyme that fixes N2, is sensitive to oxygen and it is thus important that oxygen levels in the nodule are as low as possible while still being high enough for the bacteria to live. And this is where leghaemoglobing comes in: It is present at high levels in root nodules and buffers oxygen at a constant but low level. All that the scientists at ‘Impossible Food’ had to do was to harvest root nodules and extract the haem (which was probably a lot harder than it sounds). Whatever your reason to eat vegan is (and there are plenty), there is an emerging industry that will allow you to do so without changing your actual eating habits or losing flavour. While this is potentially a great thing for the customer and the planet, it is important to realise that this product –while being vegan- is in no way natural. It was born in the lab, created not only by chefs but also by biochemists — who miraculously turn vegetables into meat. The “Recipe” and exact ingredients remain (just like in the case of Just Mayo) the company’s secret which makes it increasingly difficult for us as consumers to know what exactly we are eating. The Impossible Cheeseburger will not be available in stores for another few months. If you can’t wait that long, check out this vegan burger recipe based on carrot, kidney beans and cumin. Thank you for letting this knowledge reach others.